This system was released in France by Lasonic around 1976 under the "LASONIC 2000" name (its original name remains unknown, as hidden by additional stickers on the box). It is analog and uses discrete components, of which 7 chips and several several transistor flip-flops. It is quite well designed and plays three games: Tennis, Football and Squash. Football is rarely seen on analog and digital systems due to the need of additional components. Squash is played by two players, which is very uncommon since most similar systems play this game in solo mode (their internal circuits transform one of the players in a vertical line). The system does not display on-screen scoring, but produces sound (another rare feature for analog systems). Few settings can be set: variable ball speed and two fixed paddle sizes. Not much to say for this game ! A game rarely played by analog systems. An amazing variant for two players. Most systems play this game for a single player since the other paddle is transformed in a vertical line. Game box. 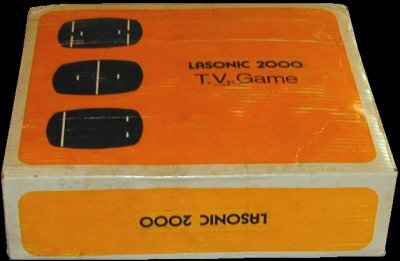 "Lasonic 2000" stickers cover original game name. System: amazing design. Controllers are detachable. Printed circuit board, showing discrete components and only 7 chips. The 2-transistor flip-flops are clearly visible.